Above: Electricity poles and lines lay toppled in Humacao, in northeastern Puerto Rico, in the wake of Hurricane Maria on September 20, 2017. AP Photo/Carlos Giusti. Hurricane Maria continued its destructive rampage on Friday morning, bringing torrential rains and high winds to the Dominican Republic and Turks and Caicos Islands. Heavy rains from the hurricane also continued to affect Puerto Rico and the Virgin Islands, and were spreading into the southeast Bahamas. Satellite imagery on Friday morning showed that Maria remained well-organized, with a large area of very intense thunderstorms surrounding a huge 45-mile-diameter eye. Even though the eye had become cloud-filled, the Hurricane Hunters detected no change in Maria’s intensity, with the pressure holding nearly steady at 958 – 960 mb, and the surface winds maintaining a high-end Category 3 velocity, 125 mph. The Hurricane Hunters reported that the eyewall was open on the southwest side, likely because of moderately high wind shear of 15 – 20 knots, due to strong upper-level winds out of the southwest. This wind shear was keeping intensification of Maria in check. Figure 1. 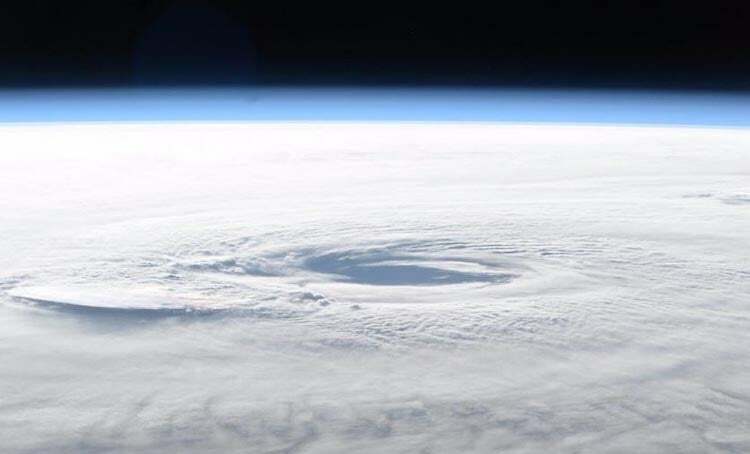 Hurricane Maria as seen on the morning of September 21, 2017, from the International Space Station. Image credit: Randy Bresnik. Early on Friday, Maria passed about 35 miles east of Cockburn Town (population 3,700), the capital city of the Turks and Caicos Islands. Cockburn Town received a direct hit from the western (weaker) eyewall of Maria, and likely experienced major damage from a large storm surge and winds of at least Category 2 strength. Cockburn Town also received heavy damage from Hurricane Irma two weeks ago. Farther to the west, a personal weather station on Providenciales recorded a peak wind gust of 57 mph on Friday morning, when the center of Maria made its closest approach, about 100 miles to the east. Maria hit the northern Dominican Republic hard with torrential rains and high winds on Thursday evening and Friday morning, as the hurricane passed about 50 – 100 miles to the north. The storm killed two people and left one missing in the Dominican Republic, and knocked out power to over 140,000 customers, including the entire northern section. A peak wind gust of 64 mph was recorded at Punta Cana on the eastern tip of the Dominican Republic on Thursday morning, and peak winds of 37 mph, gusting to 40 mph occurred at Puerto Plata at 8 pm Thursday night. Intermittent heavy rain squalls from Maria will continue to affect the Dominican Republic during the day Friday. Models are in close agreement that Maria will continue moving north-northwest, gradually angling northward, on a rather slow trek through the Northwest Atlantic over the next several days. Strong wind shear of around 20 knots will be chipping away at Maria’s strength over the next day or two, and eventually Maria will encounter the cold wake left by Jose, so we can expect Maria to gradually weaken. NHC predicts that Maria will be a minimal Category 1 hurricane by Wednesday, located a couple of hundred miles east of the Outer Banks of North Carolina. The 5-day cone of uncertainty lies just east of the Outer Banks, and about 5 – 10% of members of the GFS and European ensemble runs from 0Z Friday brought Maria into the Carolinas. These numbers have not increased since Thursday, and the consistent verdict among our top track models that Maria will remain offshore is a very good sign. Still, Maria is more than five days from its closest approach to the Outer Banks, and the latest 12Z Friday run of the GFS model predicted that Maria would come within 200 miles of the Outer Banks on Wednesday, compared to a 350 mile closest approach the model predicted in its 6Z Friday run. A landfall in North Carolina or the mid-Atlantic coast is still a possibility, though there's a more substantial chance that Maria will make landfall in the Canadian Maritimes, especially Labrador and Newfoundland, as a tropical storm or intense post-tropical cyclone. About a third of the Euro ensemble members from 0Z Friday showed Maria making landfall in the Maritimes. Figure 3. Estimated rainfall from Maria through 6 pm EDT Thursday, September 21, 2017. 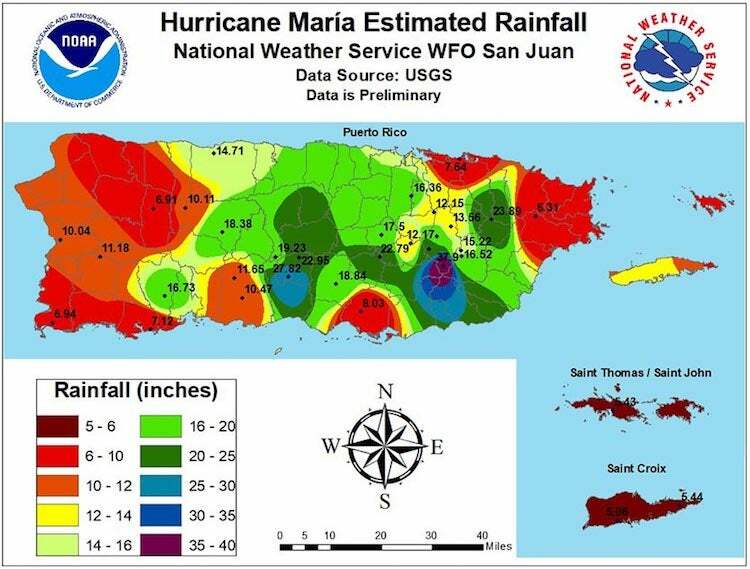 Image credit: NWS San Juan. One of the strongest hurricanes ever to rampage through the Caribbean, Maria has inflicted billions of dollars in damage on places that may struggle to put the pieces back together. Considering the destruction from Maria, the hurricane’s death toll thus far is mercifully low— 15 in Dominica, 13 in Puerto Rico, 2 in Guadelope, and 2 in the Dominican Republic–although dozens remain missing in Dominica and some parts of Puerto Rico have yet to be heard from. 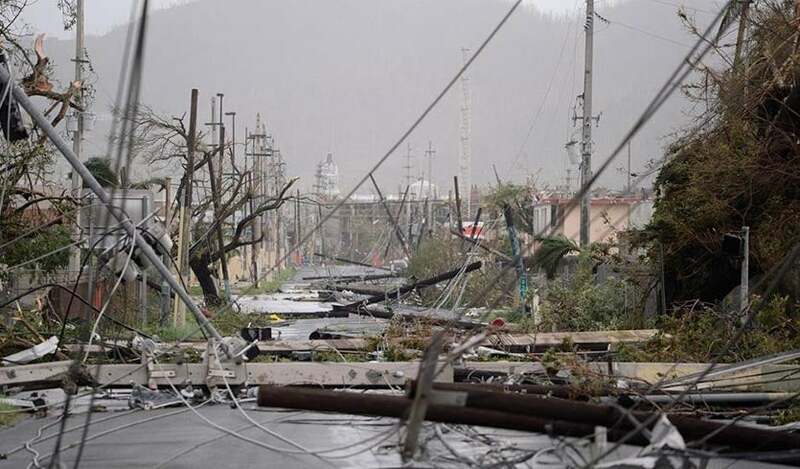 Power and water are out across Dominica, and at least 90 percent of buildings have sustained some damage, with the east coast hit hardest, according to the Caribbean Disaster Emergency Management Agency (via ReliefWeb). All of the island’s crops are likely destroyed, says CDEMA. Aerial photos and tweeted images indicate widespread damage across St. Croix (one of the U.S. Virgin Islands), whose western end experienced some of Maria’s strongest winds. Fortunately, the damage on St. Croix appears less severe than on the Virgin Islands hit by Hurricane Irma, according to the Virgin Islands Daily News. In Puerto Rico, damage is still being assessed after flash flooding that continued through Thursday. It will be a daunting task to get the power back on across the territory. Even before Maria, Hurricane Irma had knocked out roughly 70 percent of the island’s grid. The head of the Puerto Rico Electric Power Authority told CNN that “the system has been basically destroyed” and that it could take up to six months to complete repairs. Puerto Rico’s power grid has been weakened by deferred maintenance, in part an outgrowth of manufacturing losses and mounting territorial debt that have left the power authority bankrupt. Moreover, as noted by Quartz, Puerto Rico’s grid is almost completely reliant on fossil fuels (mainly fuel oil), which provide 98% of electricity in Puerto Rico vs. 65% in the 50 U.S. states and just 2% in Costa Rica. In the wake of Hurricane Irma, some homes and communities in Florida with solar power were able to restore their electrical service before repairs to the larger grid were complete, according to Inside Climate News. The largest oil-fired power plants in Puerto Rico are in the south, notes the Los Angeles Times, and there may be heavy damage to the transmission lines that bring power to the north. Puerto Rico was declared a federal disaster zone on Thursday, which will enable residents and the local government to apply for assistance from FEMA. With any luck, the rebuilt power grid will be far more robust than the aging one was. Life over the coming weeks—or months in some cases—will be a grueling ordeal for many Puerto Ricans, especially those who lack generators. Most of the island’s wireless cell sites have been knocked out, and the patchy grid will further complicate phone usage. Weather Underground’s 10-day outlook for San Juan has lows near 80°F and highs between 85°F and 90°F throughout the period. Very high dewpoints will put the heat index near or above 100°F each day. 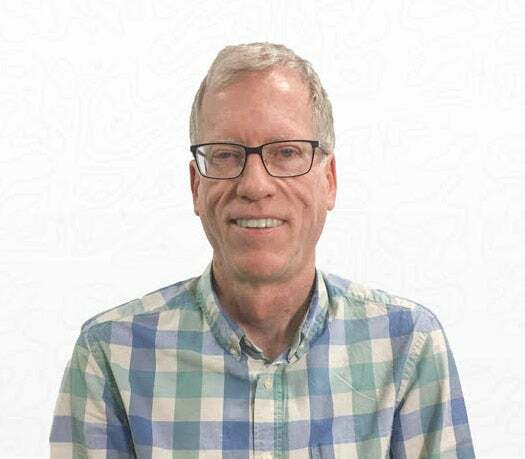 The risk of heat-related illness or death rises greatly when there is no relief from very high temperatures around the clock for multiple days. NHC is now in its third week of issuing advisories on the long-lived system that it reclassified as Post-Tropical Cyclone Jose on Thursday night. Jose’s 16.5 days as a tropical cyclone made it the seventh-longest-lived named storm in Atlantic records since the start of the satellite era (1966), according to Phil Klotzbach (Colorado State University). 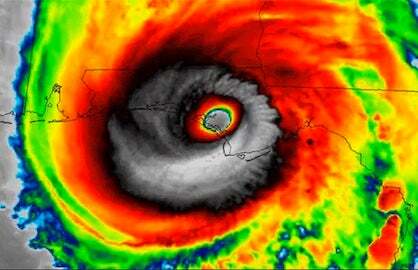 Jose came within just five days of the satellite-era record of 21.25 days held by Hurricane Ginger (1971). As of 11 am EDT Friday, Jose was centered about 120 miles south-southeast of Nantucket, Massachusetts, drifting southwest at just 2 mph. Jose’s top sustained winds are down to 45 mph, and its showers and thunderstorms have become even more sparse, limited mainly to a few patches on its southwest side. A tropical storm warning remained in effect for the islands of far southeast New England. The area received its highest wind gusts yet from Maria on Thursday night, including 62 mph at Nantucket and Aquinna, MA and 61 mph on Block Island, RI. The rains are adding up as well: Nantucket had received 5.95” as of late Thursday, with light rain continuing Friday morning. Jose is expected to continue drifting westward, influenced in part by Maria, before degenerating into an open wave by early next week. Figure 4. 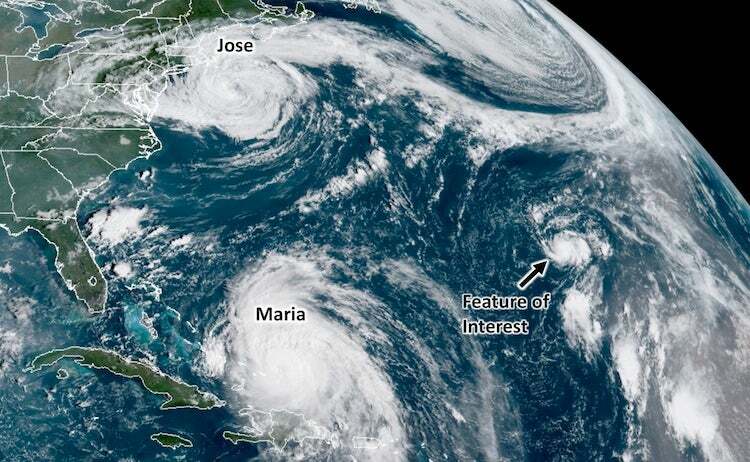 Dwarfed by Hurricane Maria and Post-Tropical Cyclone Jose (left), a small area of low pressure in the central North Atlantic (right) could become a tropical cyclone in the next several days. Image credit: RAMMB / CIRA @ CSU, via Philippe Papin (@pppapin). Son of Lee: A potential mini-spin-up in North Atlantic? Tropical Storm Lee dissipated last Monday, but we may see a tropical cyclone develop from some of its remnants over the next day or so. Philippe Papin (University at Albany/SUNY) called attention on Thursday night to a small spin-up along an elongated zone of low pressure extending north from Lee’s old center of circulation. Some banding was evident with showers and thunderstorms around this feature on Friday morning, noted Papin. ASCAT scatterometer data showed a circulation with 20-25 mph winds centered around 29°N, 49°W, heading slowly northward. Wind shear is around 10 – 15 knots in the area of this disturbance, but a large zone of weaker shear lies just to the north, and SSTs of around 28°C (82°F)—about 1°C above average—are more than adequate for development. In a special update to its 8 am EDT Tropical Weather Outlook, NHC gave this feature a 30 percent chance of becoming at least a tropical depression by Sunday and a 40 percent chance by Wednesday. Given the favorable pre-conditions, we’d put those odds a bit higher: 50 percent by Sunday and 70 percent by Tuesday. If this system develops and is deemed by NHC to have roots in the remnants of Lee, it will take the name Lee; otherwise, it will be named Nate. 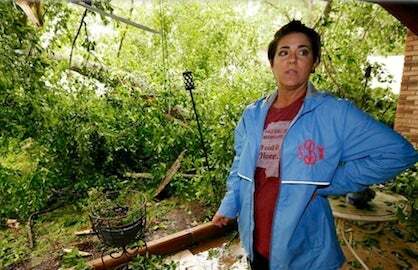 The Portlight.org disaster relief charity, founded and staffed by members of the wunderground community, is responding to Hurricane Maria in Puerto Rico and the U.S. Virgin Islands, and is continuing its efforts for victims of Hurricane Harvey and Hurricane Irma.